Depends what is on it…. 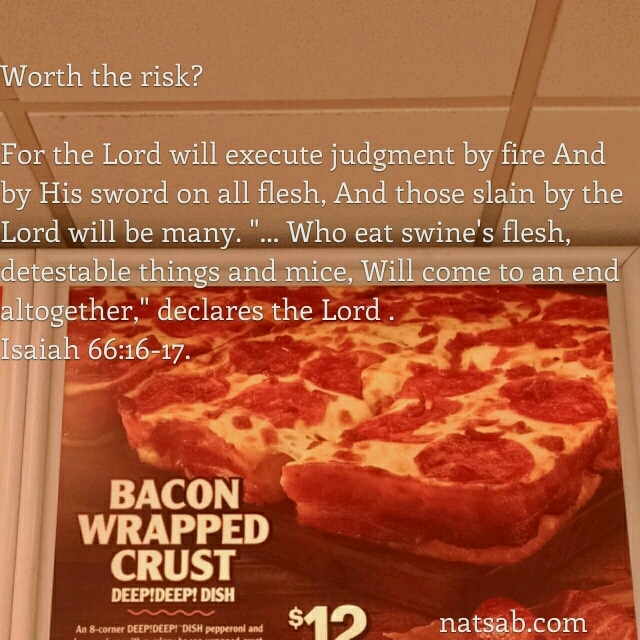 This entry was posted in Visual Scripture and tagged clean, food, judgment, pizza, pork, unclean. Bookmark the permalink. 6 Responses to Is pizza bad for your health? Thanks, Pete, for making this SO obvious! Few seem to connect the dots of what the Word says and how we are to live. I know believing people who are pork farmers and do not see any conflict. How much plainer can it be? ……… I know the reason! They read Scripture through the lens of theology and so certain things are done away with! Really? From Uganda. Shalom and blessings on your journey. We’ll keep you in prayer. I/we raised hogs on our little homestead and sold them at a loss when we became convinced of the truth in these and other verses over the traditions we had been raised in. The Scriptures are so simple a 5th grade education can get it right. Seminary is a hindrance! I’m still UNlearning some things. Or maybe Isaiah’s a false prophet…not!